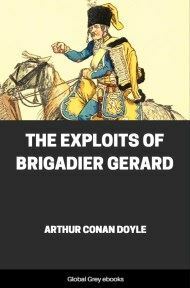 The hero of this novel, Etienne Gerard, is a Hussar in the French Army during the Napoleonic Wars. Gerard's most notable attribute is his vanity - he is utterly convinced that he is the bravest soldier, greatest swordsman, accomplished horseman and gallant lover in all France. Gerard is not entirely wrong since he displays notable bravery on many occasions, but his self-satisfaction undercuts this quite often. Obsessed with honour and glory, he is always ready with a stirring speech or a gallant remark to a lady. Conan Doyle, in making his hero a vain, and often rather uncomprehending Frenchman, was able to satirise both the stereotypical English view of the French, and - by presenting them from Gerard's baffled point of view - English manners and attitudes.